In Italy, A Medieval Town Confronts A Double Threat — Erosion And Too Many Tourists : Parallels The survival of Civita di Bagnoregio has grown more uncertain as erosion eats at the base on which it sits. But tourists — 850,000 expected this year in a town of 10 — may pose an even greater threat. To get to Civita, one must take a long, winding footbridge from the neighboring town of Bagnoregio. Tourism is booming in Italy, which welcomed close to 50 million visitors over the summer. That has helped some places that have been struggling to survive. But for one destination, it might be too much of a good thing. Civita di Bagnoregio is in the northern corner of the Lazio region, 75 miles north of Rome, tucked between Tuscany and Umbria. On the road, signposts point the way to "Civita, The Town That Is Dying." 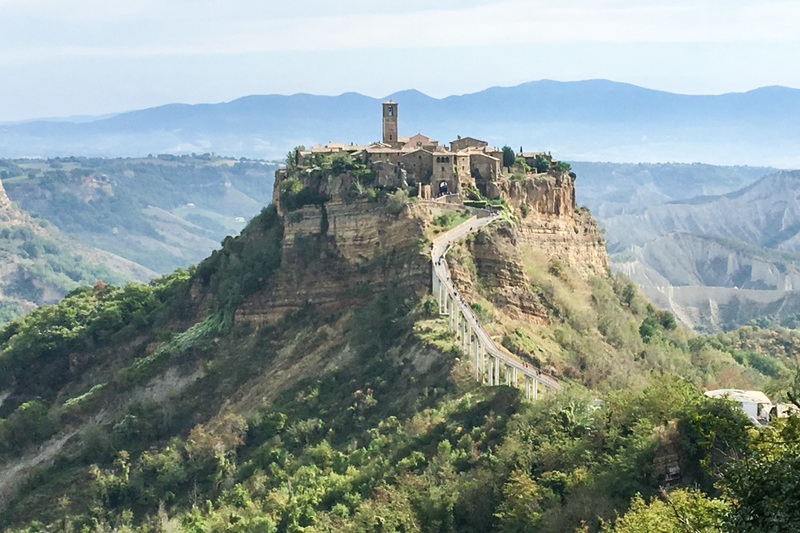 And in fact, not so long ago, Civita was at death's door — shrinking because of erosion and landslides and in need of constant restoration. Then, in 2013, the town took a bold step: It became the first (and perhaps the only) Italian town to charge visitors an entry fee. The result? Civita has become an international tourist destination. 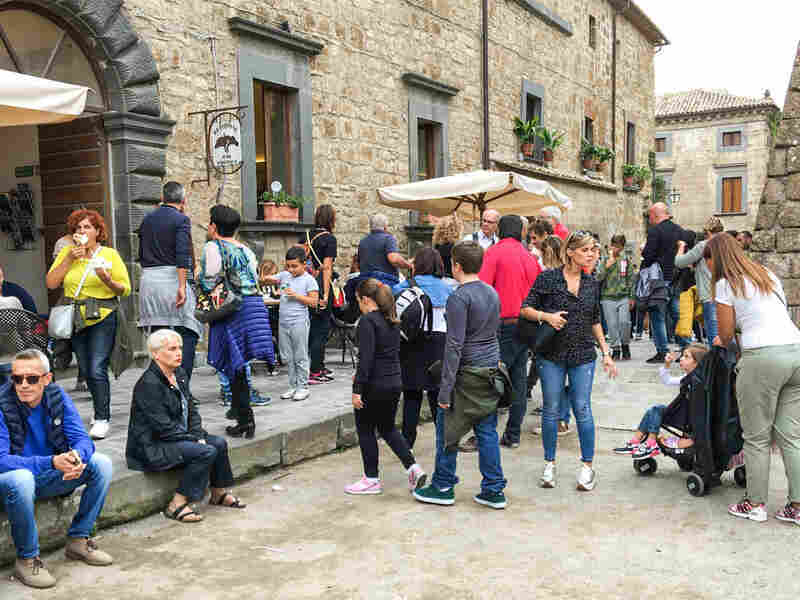 At 10 a.m. on a Sunday in late September, visitors leave their cars and tour buses at a parking lot at the edge of the town of Bagnoregio and set off on foot. At the bottom of a steep cliff, there is already a long line at the ticket booth. On weekends and holidays, the fee is about $6. On weekdays, it's $3.50. On major holidays such as Easter and May 1, the number of day-trippers can reach 10,000 to 15,000. Visitors to Civita are warned to carry as little as possible because it is a tough trek across a long, winding and very steep footbridge. At the top, a fairy tale hamlet floats in the clouds — below it, a stunning landscape of deep, clay-colored canyons. Visitors to Civita are warned to carry as little as possible because of the tough trek. Only 10 people can call the tiny town home. After passing beneath the Gothic Archway of Porta Santa Maria and catching one's breath, the first stop is the Geological Museum of Landslides. Numerous maps and exhibits show Civita's gradual reduction since the ancient Etruscans founded the town on volcanic rock 2,500 years ago. It's estimated that today's Civita is just one-third of the original settlement: It's 500 feet long and 300 wide. 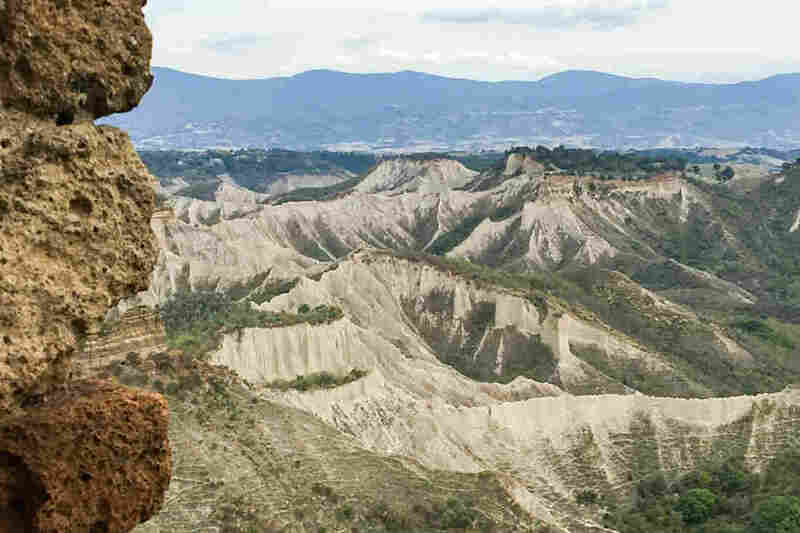 Its big decline, says geologist Luca Costantini, began with a strong earthquake in 1695, when some 3,000 people lived here. "A little by little, they go away," he says. "Now the number of people who live in Civita is 10 persons. In the future, the city can disappear." The cause is erosion. The mountain's sides are melting away, plummeting to the canyons below. Three million years ago, Costantini explains, this was a large inland sea. Some 500,000 years ago, that sea disappeared when a nearby volcano erupted. Lava and ash spewed out, creating a plateau of volcanic tufa rock. Gradually, the surrounding landscape evolved into steep, chalk-colored canyons — called calanchi in Italian — that create an otherworldly atmosphere. "The landscape of the calanchi, those cliffs, is a lunar landscape," says landscape architect Thomas Allsop. A native of Seattle who first came here on a study grant two years ago, Allsop says Civita's fragility is due to a soft clay layer that is giving way under the hard volcanic rock. "That's really the major problem, is what the tufa is built on, is what is really unstable, especially when it rains really hard and they have the slides," he says. Chalk-colored canyons — called calanchi in Italian — create an otherworldly atmosphere around Civita. One building that slid down the cliffs long ago was the 13th century birthplace of St. Bonaventure, Civita's favorite son. An average five to 20 landslides per year leave Civita perching precariously above a crumbling precipice. Nevertheless, several Romans and Americans have bought homes and spend summers here. And the small town is packed with charm. Old stone walls are draped with clinging vines. Well-tended flowerpots are lined up on balconies and staircases. There is also the occasional surreal glimpse: a medieval façade with wooden door still intact and the bright blue sky visible through the window above — a sign the rest of the building is long gone. Residents and those nearby want to keep the town alive, but that requires constant restoration. To fund it, the town introduced the tourist toll in 2013. Paradoxically, the visitors fee has proven to be an extraordinary tourist magnet. Mayor Francesco Bigiotti says he is getting calls from other Italian towns that would like to do the same. Day-trippers wait in line at one of Civita's few cafés. "Four years ago, before the entry fee," says Bigiotti, "we had 40,000 annual visitors. At the end of this year, we forecast 850,000." The fresh funds allowed the elimination of local taxes and there is close to zero unemployment, thanks to 200 new startups in the region. But the town cannot provide sufficient services for such large numbers — it has only a few cafés and restaurants and two public toilets. One booming business is Maurizio Rocchi's restaurant Almacivita. His family roots here go back to the 16th century and he is proud that Civita is flourishing. But living and working here, he says, is tough. With no pharmacy, post office or shops, he has to trek across the footbridge to neighboring Bagnoregio every day to buy everything. "So you really have to plan your day, every day, very well," he says. "You cannot forget anything, because there are no markets up here." 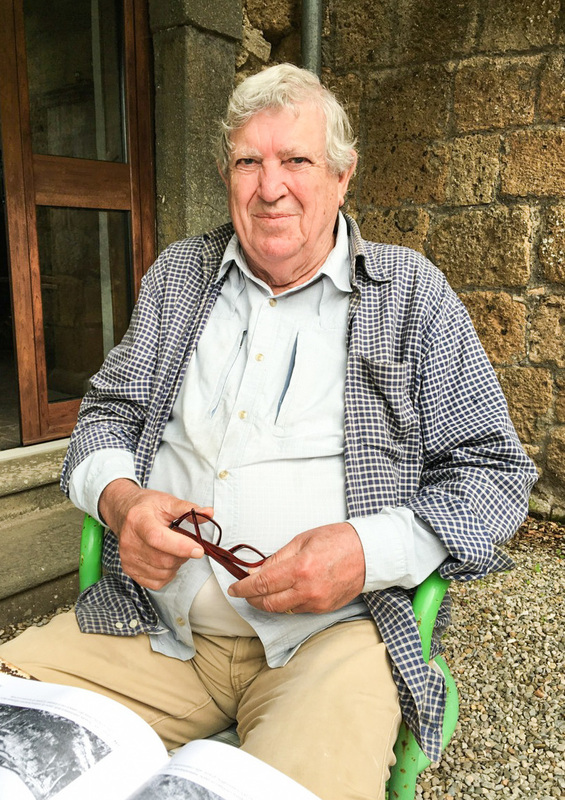 American architect Tony Heywood is one of 10 permanent residents in Civita. He laments "the masses of people who come on weekends, and the noise and confusion." It's not just the visitors entry fee that has attracted tourists. 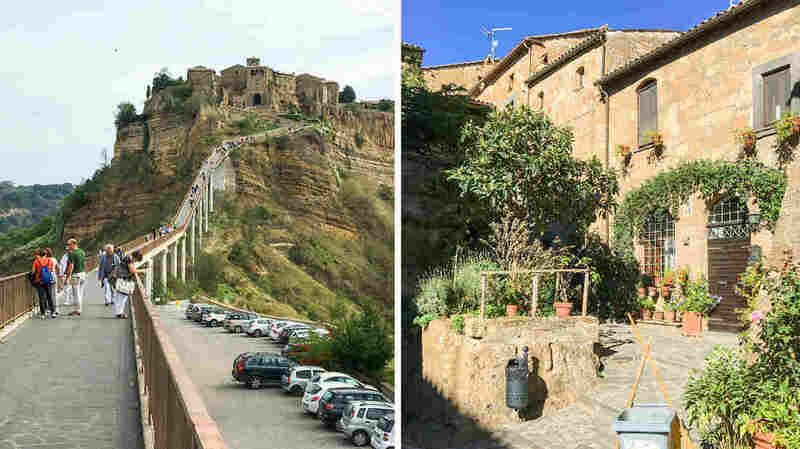 American travel writer Rick Steves has written that Civita is his favorite Italian hill town — an endorsement that draws American and Canadian tourists in droves. There is also a very large contingent of Japanese tourists. On this Sunday, they include a bride and groom having their photos taken on the footbridge. The Japanese are said to be drawn here by an 1986 animated movie, Laputa: Castle in the Sky, by famed Japanese filmmaker Hayao Miyazaki. He was reportedly inspired by his visit to Civita. By 3 p.m., there are some 6,000 visitors jamming Civita's narrow cobblestone streets. There are lines everywhere. American architect Tony Heywood laments "the masses of people who come on weekends, and the noise and confusion." Heywood first came here with his wife in the 1960s. Now one of Civita's 10 permanent residents, he acknowledges tourism has been good for some townspeople. "Some are profiting from it, but not everybody," he says. "And the very reason some people came here was to get away from this." Civita's survival has always depended on the forces of nature. Now the town is a candidate for UNESCO World Heritage Site status. But UNESCO is promoting sustainable tourism. So Civita may face a new challenge: limiting its number of daily visitors.